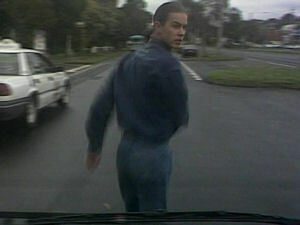 In a hurry, Todd runs across a road and is hit by a van. Dorothy anxiously paces the floor. A nurse comes out of a room. Phoebe is talking with the doctor and won't be long. Everything is alright, and if Phoebe is up to it Dorothy will be able to take her home within the hour. Dorothy is surprised, but the nurse reassures her. Dorothy tells her she will be well looked after. The nurse tells her she will tell her when she is finished. Police and paramedics are at the accident scene. The driver of the van didn't see Todd - he just ran out. On the asphalt Todd lies in excruciating pain. A paramedic asks his name, but gets no response. 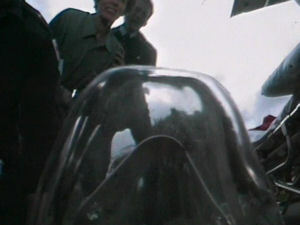 As they put an oxygen mask over his mouth Todd sees a flashback of the van coming towards him and him turning around. The paramedics cut through his clothes. Todd looks up to see the van driver asking if he's alright. The paramedics put a collar round his neck. A police officer asks for witnesses and one man comes forward who saw the whole thing. The van comes towards him in Todd's mind - he turns and it hits him. The paramedics lift him up. The witness says Todd was in a hell of a hurry. The van driver cries that she has a boy of her own, but the witness says not to blame herself - he wasn't looking where he was going. The police find Todd's ID. 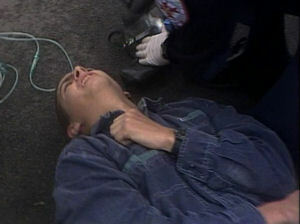 Todd is lifted into the ambulance as the crash plays through his mind. The ambulance leaves the scene while witnesses look on. Jim and Paul are sitting talking. Jim pledges his support to Todd and Phoebe, should they decide to have the baby. Paul adds that Andrew will be rapt - it's the next best thing to having a baby sister or brother. Jim asks whether Paul's been thinking about having any more kids with Christina but he says they haven't progressed that far yet - he's doing his best but part of her still thinks he's a traitor. Jim tells him to be patient. Paul says the hardest thing for her is to believe he's still crazy about her after what happened with Caroline. Jim is telling him to be persistent when the phone rings. Jim answers and Paul asks what's wrong when he hangs up. As he scrambles about to find his keys Jim tells him it's the hospital - Todd's been hit by a car and it's serious. They work out that Phoebe is still in the clinic. Paul tells him they'll go in his car where Jim can use the mobile. Paul is frustrated by the phasing of the traffic lights. The clinic is still engaged and Jim tries again. 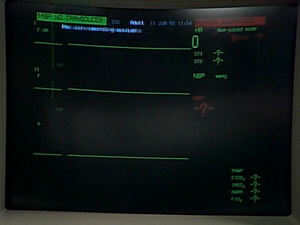 The nurse answers and Jim asks for Dorothy. The nurse tells Dorothy the call is urgent - Dorothy is confused as to who it could be and thinks it must be Todd. Jim corrects her and asks if Phoebe is there - Todd has been run over. 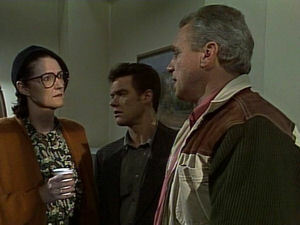 Dorothy is shocked and Jim goes on to tell her that Todd had been on his way to the clinic to see if Phoebe would change her mind about the baby. He's badly hurt and Phoebe should be told. Dorothy tells the nurse she has to speak to Phoebe as something has happened, but the nurse tells her she will be in theatre. 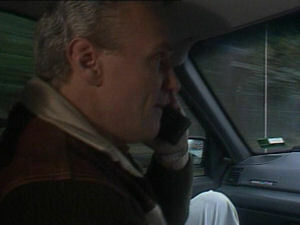 Dorothy tells Jim she will get Phoebe to the hospital as quick as possible and hangs up. She stresses to the nurse that the father of the child has had an accident and it's an emergency - the nurse will see what she can do. Madge and Lou are looking at a leaflet for a holiday destination - Madge reads that it is a peaceful retreat with panoramic views - better than that claustrophobic nudist resort. Lou replies that it was only claustrophobic as she locked herself in. 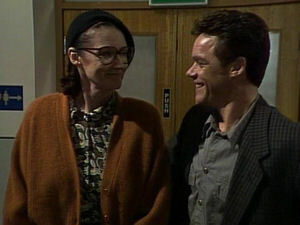 Madge hugs Lou, thanking him for backing down on their bet - she didn't want to go back to Verity Valley. Lou says he would have backed out anyway. The phone rings and Lou tells her not to get it, but Madge says it'll only take a second. It's Jim and Madge tells Lou the news. 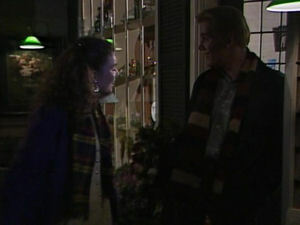 Madge tells Jim they'll make sure Helen finds out and hangs up. She tells Lou they're going to be needed here. It's bad, Lou says and Madge says yes. 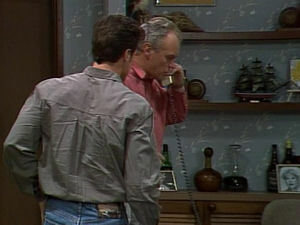 Jim is trying to get through to Todd's mother Annette but she isn't answering. Jim relays to Paul about Madge telling Helen - Paul says at least they can rely on her to break the news gently. 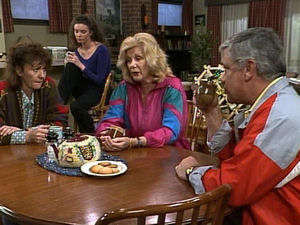 Dorothy and Phoebe arrive, and Phoebe asks if she can see Todd. Jim says that he's in theatre and tells them to sit down so he can tell them the whole thing. But Phoebe is insistent and asks what the doctors are doing. Jim tells them that Todd was brought in with very serious injuries. The doctor wasn't certain but suspected a ruptured spleen and they took him to theatre straight away. But he'll be okay, Phoebe ventures hopefully. They aren't certain - it's a race against time. It's not the removal of the spleen but the loss of blood that is dangerous. Dorothy assures her that the doctors are doing their best and Jim says if they stop the internal bleeding there's a chance. Dorothy reminds her that Todd's a fighter. Phoebe is convinced that they have to save him. Madge and Lou sit with Pam and Gabby. They haven't heard anything but Pam says this isn't unusual - accurate diagnosis is tricky when the patient comes in unconscious, but Todd's in good hands. Gabby is frustrated. Madge and Lou decide to go over to Helen's to wait for her. Madge offers the trip to the mountains to Pam for her and Doug but at a time like this Pam would rather be close to the hospital. Madge turns to Gabby who has a new boyfriend, Simon, but Gabby refuses, saying it wouldn't feel right. But Pam says she would just be waiting around and she can do it up there - it would be good for her to get away. She agrees, saying she can always come back if needed. Madge and Lou leave. Jim is telling Phoebe that he should have given Todd a lift - he must have been thinking more talking to her than the traffic. Phoebe asks why he wanted to speak to her. When Jim is less than forthcoming she demands to know. 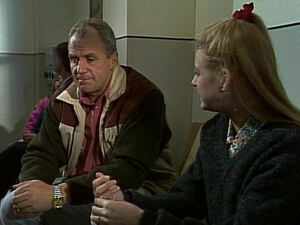 Jim confesses that Todd was having second thoughts about the termination and was on his way to discuss it with her when he was run over - but Jim says he thought she knew that already, as Todd had been troubled about it. Paul tells her he spoke to Todd some time ago and he wasn't convinced. Phoebe asks why he didn't say something, but Paul says he was scared of losing her. Todd's father had told him it would be a mistake to settle down young, which he bought at first but then realised his life didn't have to turn out like Bob's did. Phoebe excuses herself, taking it all in. Dorothy appears and Jim admits he might have just put his foot in it. 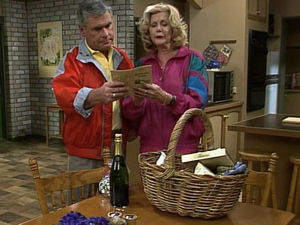 Dorothy is dismayed, but Jim thought she had already told Phoebe. Dorothy points out that, with Todd fighting for his life, Phoebe already has enough to cope with. Pam talks about Simon, saying he's a nice guy and genuine but Gabby should make sure he doesn't get the wrong idea by being invited away for the weekend. Gabby assures he knows she wants to take things slowly. But Pam keeps on at it, saying she should make sure he knows. Gabby says she'll ring the guesthouse and change the booking to two separate rooms. But then she says she feels callous about going away - she can't stop thinking about Todd. Pam says the opportunity might not come again though and hands her the phone. Phoebe won't forgive herself if anything goes wrong with Todd but Dorothy says she mustn't blame herself. Phoebe asks why didn't she ask him what he really felt but Dorothy reminds her she did. But Phoebe is convinced she should have done something. Paul is frustrated that they haven't told them anything and it's been ages since Todd was taken to recovery. Then Phoebe shouts 'Todd' and they see him being wheeled down the corridor. The doctor tells them Todd will be fine - he's a very lucky young man. It got hairy in theatre at one stage but Todd is a courageous fellow. Jim thanks him. Todd will need to rest but will be fighting fit in a few weeks. Phoebe thanks the doctor, telling him it's unreal. He's allowed visitors but not too many, so Jim and Phoebe go in to see him first. Todd comes round and is glad to see them. Phoebe tells him what the doctor said. Todd asks if anyone else was hurt but Jim tells him the driver was fine. Todd can't really remember the accident but thinks it was his fault. Phoebe says the main thing is he's okay. Todd tells it would take more than a lousy car to get rid of him, but Phoebe tells him not to. She was terrified she'd lose him. Todd promises he isn't going anywhere - he loves her too much. Jim leaves to let Todd rest but Phoebe remains by his bedside. Gabby rings the bell for attention. Simon thanks her for inviting him. Gabby apologises for being such a basket case earlier but he tells her she had every right to be anxious about Todd. At least they found a phone and, now they know Todd will be fine, Gabby promises him she'll be the most scintillating company. Simon kisses her, but she reminds him about going slowly. He tells her he's had his share of disappointments and doesn't want to blow his chances with her. Gabby rings the bell again and Simon opens the office door but no ones there. He tells her to wait and he'll have a look outside. Paul is on the phone to Annette. He hangs up and sits at the table with Pam, Lou and Madge. Annette was going through hell and burst into tears when Paul told her Todd was fine. Lou says it takes it's toll and Madge sarcastically talks about all the nights he's worried about Guy and Lauren. Lou says he's been lucky but Pam tells them it's instinctive to fret and she gets worse the older they get - at least when they're little you can keep them by your side. Paul unhappily says it's what you hope for and Pam realises she's put her foot in it. But Paul tells her not to apologise - whatever happens between him and Christina, Andrew will not suffer. Madge says they are getting too serious and suggests they hold a welcome home party when Todd gets out of hospital. Lou starts planning his speech to Madge's annoyance. Jim and Dorothy watch over Todd and Phoebe. Todd asks her how she's feeling, and she replies fine. Dorothy decides to give them some space and leaves with Jim on the pretence of getting something to eat. Phoebe says she feels ashamed for not showing more interest in Todd's feelings but Todd says she hasn't been selfish. She reveals she knows why he was going to the clinic. Todd tells her he did want the baby but he's not about to lie that guilt on her after what she's been through. Phoebe tells him she's still pregnant - she got the news about him just before she was about get the anaesthetic. Todd smiles and she says she's going to keep it. She's had a lot of time to think about life without him and it's not nice. With the baby being part of him she wants to have it. Todd is concerned about money but she says that after today she knows things will work out. Todd tells her she's beautiful then rolls onto his back, struggling for breath and seizing while the heart monitor alarm rings. Phoebe asks him what's wrong as a nurse comes in. As she is taken from the room by nurse she screams at 'Todd, what's wrong?'. Two nurses run with a crash cart past Jim and Dorothy in the corridor and into Todd's room, where the nurse is performing cardiac massage. 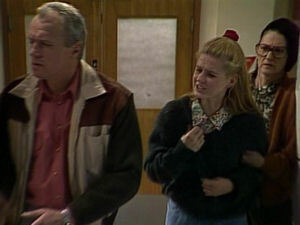 The doctor uses a defibrillator as Jim, Dorothy and Phoebe watch from the doorway. As Todd flatlines Phoebe shouts 'Todd, don't do this!' The doctor continues to shock him as Phoebe screams out Todd's name.